For years it just accumulated, since I didn’t feel there was enough to have changed at Coinstar and I couldn’t think of anything to do with it in the interim. Once I married Micah, however, I began to learn all the things one could do with a coin jar (we combined our collections). Are they still $.41? (Micah buys them all.) If we need a stamp or two, we just dig into the coin jar. Stamps are particularly cool because they’re in odd numbers and help us use our pennies. (It’s embarrassing, but I get them sometimes.) $.15 per day per adult book. If it’s just a book or two, using change is much easier than paying with a dollar bill. You don’t have to deal with the new change. And you really can’t write a check for $.15. Have you ever been on a trip where you periodically encounter $.25 or $.35 tolls? Not cool. If you know in advance, though, you can bring along a fair amount of change. Or bring a handful along and use it to pay odd numbered tolls (like when you’re on a turnpike and have to pay $1.65). I almost never buy from them, but sometimes I know I’m going to be in a situation where I can’t bring food and might need a snack. DC Metrobuses accept SmarTrip cards, but sometimes you sit on them and have to buy a new one. Having change can help you ride the bus in the meantime. And if you want to use up a bunch of spare change, take it down to the metro station and add it to your SmarTrip card (though I don’t know if it takes pennies). CoinStar is pretty cool. Sure, it takes a portion (does anyone know of a type that doesn’t?) but it makes your money much more accessible. We’ll probably do this at some point with our pennies…which are harder to get rid of. MBH thinks that picking up pennies rocks! KMC is encouraged that his daughter sees the value of small change. SVB posted about a zillion cool piggy banks. I think a coin jar works better for my purposes (easier to get them out) but these are too cool to pass up. I change coins at my regular bank for no charge. You could check yours. I also do all you do with saved coins – except Coinstar – I would never use this as I’m not giving up any of my money for a task I can easily do myself. Instead I ask at my bank for ‘coin roll papers’. They are free and the only way the bank will take change is if it’s rolled. Used to be every bank had a coin counting machine, now there is NOT ONE bank in my county that has one. So, I roll. It’s relatively mindless and I love seeing how much I have saved. I keep a coin jar on the night stand and empty all my loose change into it every night. About once a year, we stop by the bank, pick up coin wrappers, and my wife and I watch a movie and wrap coins, usually $150-$200 of otherwise unaccounted for money. Most banks will give you the wrappers and take the coins back with no charge as long as you have an account. We take the wrapped coins, deposit them, and split the earnings – half goes to debt snowflakes, and we use the other half to treat ourselves to a special home cooked dinner with friends that we wouldn’t spring for otherwise – last year was a $50 cut of beef tenderloin, this year we’re thinking lobster feast. I was slow to realize the considerable impact coins can make. I wrote about it last month in my post http://moneymyths.org/blog/2007/11/11/keep-the-change/. A couple of readers alerted me to the fact that you can get gift cards from Coinstar and bypass their usual 8.9% fee. Still, I prefer to cash them at the bank, or just deposit them to savings. Coinstar doesn’t charge if you put it towards a gift card. There are several vendors to choose from including Amazon and Starbuck. So that is a way not to lose out! My bank does the coin counting thing for free. I wouldn’t have guessed that if I hadn’t been there when some ladies brought in a huge jar of coins. My grandmother used to save all of her quarters, and then in December my brother and I would help her count and roll them. The money went into savings accounts for college. It helped us understand the importance of saving for large purchases. By the time I graduated from high school,there was $500 in that account. It certainly wasn’t enough to pay for college, but since I got full scholarships anyway it did provide a nice boost to my savings. 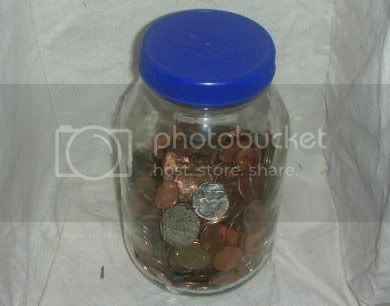 I have always had a coin jar. I consider it an adult piggy bank. I currently have two jars, one for pennies and one for silver coins. When the penny jar gets about half to three fourths full, I sit down and wrap the coins and then take them to my bank and deposit that to my checking account. When the “silver jar” gets full, I roll the coins and then (like Debt Magnet) use the “found money” to spurge on a treat. I will admit I do pilfer the quarters from the silver jar sometimes for the laundromat. I did not know Coinstar waived it’s fee for gift cards, that is also something to look into. If you go to a Chevy Chase bank branch, they will cash out your coins for free, even if you don’t have an account with them. Even better, you still get to dump it in the machine yourself and watch it add up…which is almost the best part! A lot of banks are providing free coin sorting now. Chevy Chase Bank offers a coinstar type machine free for customers. I have an account with them but my current balance is a whopping $.01 because their interest rates are horrible. I always funnel deposits to my other higher interest bank accounts. I use coinstar for pennies & nickels since I don’t feel it’s worth my time to be rolling them. I had an old mechanical bank as a kid. An elephant that you would put the coin in his nose, pull the tail and it wouldflip it into a basket on his back. I would run around snagging all of th change I could find, since it was fun! Tried eBay, but they are collectable now so pretty expensive. I agree with Alyssa! Don’t pay the fees for Coinstar! My local credit union has a giant thing that you can dump coins into (it’s crazy looking) for NO cost! I’ll add my vote for using the bank instead of Coinstar. It’s true not all branches have them, but many large bank branches will have a coin sorter. It’s worth a few minutes of calling to find one that’s not out of the way. Even if you have to open a free checking account, I definitely think it’s worthwhile! We have a mortgage piggy, any coins saved go towards mortgage overpayments. It’s amazing how it adds up! I have never heard of Coinstar. Paying a fee to cash in change? No way! Banks in my area will all do it for free with a coin counting machine. Like Amanda, I use very little cash and therefore don’t have much change. I usually have to go to the bank to GET change the one or two times a year I’m going to/through Chicago (tolls)! I always ensure the coin jar is filled with coins so as to motivate me further to save up more coin!